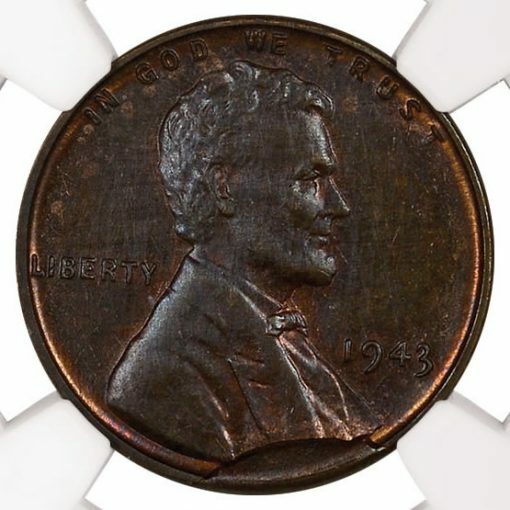 Numismatic Guaranty Corporation (NGC) recently authenticated and graded four Lincoln cents struck on wrong planchets, including two 1943 bronze cents. Zinc-coated steel was used for cents in 1943, instead of copper which was used previously, to conserve copper for other uses during World War II. Despite the changeover, a small number of bronze cents were pressed in 1943, making them highly coveted and one of the most famous U.S. error coins. "1943 Lincoln cents struck on bronze planchets are one of the ‘Holy Grails’ of US numismatics," says error coin specialist David J. Camire. "It is very exciting to see two examples in a single submission, especially the unique example featuring the die break on the obverse." In the 100 Greatest Mint Errors book, co-authored by Camire, the Philadelphia Mint-struck 1943 bronze cent was ranked #4. 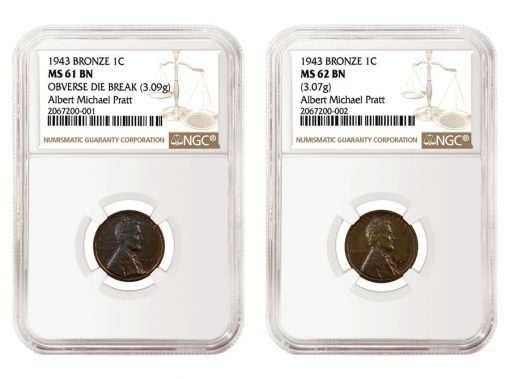 It is believed that only 10-12 1943-P bronze cents exist, which does not include the two most recent examples authenticated by NGC — one graded NGC MS 62 BN and the other graded NGC MS 61 BN. 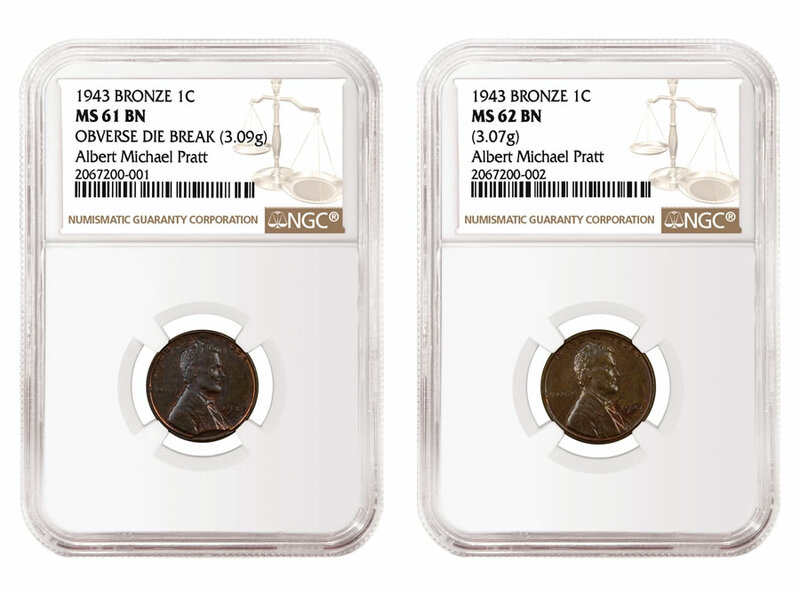 The former specimen, at MS 62 BN, ranks as the second-finest 1943 bronze cent certified by NGC. The latter is particularly interesting, however, because it is the only example known with a large die break on the obverse. The submission of the two 1943 bronze cents also included two Lincoln cents struck on planchets intended to be used for foreign coins made by the Philadelphia Mint. 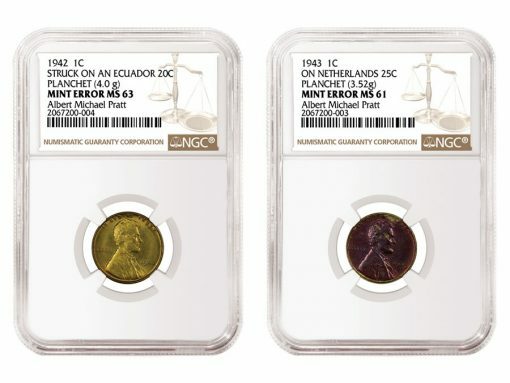 There was a 1942 cent struck on an Ecuador 20 Centavos planchet, which NGC graded MS 63, and a 1943 cent on a Netherlands 25 cent planchet that was graded NGC MS 61. "It is extremely unusual to see wrong planchet error cents from this time period," adds Camire. "Recent appearances of such errors are few and far between." This group of coins was submitted to NGC by the family of former U.S. Mint employee Albert Michael Pratt. They were brought to the West Hernando Coin Club coin show in January 2017 where they were shown to John A. Zieman Jr. of Z-man’s Coins, who submitted them to NGC on behalf of the family. "NGC has a great reputation for being very consistent, has awesome customer service and very fast turnaround times," says John Zieman. For more information about Z-man’s Coins, visit zmanscoins.com. Wish I owned these! I have been searching for this penny for many years now! Congrats to whomever owns them!!! I’m surprised the Secret Service hasn’t seized these coins. How are these different from the Langbord gold coins. I don’t think the Mint authorized these “error” coins to be released in general circulation, right? Very interesting; apparently quality control dropped at the Mint during both world wars since demand was so high and a number of experienced people were gone in service. Hence the overdates too. I have a ’43 “copper” but it is of course a plated steel cent, easy to tell with a magnet. Looks good in a case, though. I have 3 Lincoln pennies 1943 but they’re not copper or bronze but yes I got them in New York State for many years and I don’t know if they’are worth anything. How much are they Worth?I may seriously have one. Ernesto: 1943 and 1944 off-metal cents differ from the Langbord double eagles in that the latter are standard-issue coins that were never released to general circulation but by most accounts were instead removed from the Mint surreptitiously. The cents are error coins that entered circulation as part of the normal release process. While they’re spectacular errors, their genesis is little different from other errors such as clipped planchets, flans, or even mules that escape quality control and make it to the general public via standard banking channels. Santos, Rayford, et. al. : While this isn’t really a “whatzit worth?” site, regular-issue steel cents from 1943 aren’t considered to be rare. Over a billion were made and a lot of those were saved due to their unusual appearance. You can probably get a decent-condition example for 50¢ or so, depending on its mint mark and degree of oxidation. I’ve seen where they have a 1942 penny struck on an Ecuador 20C planchet, I’ve got a circulated one it,s gold in color neet,est thing i’ve found. Didn,t know what it was tho.